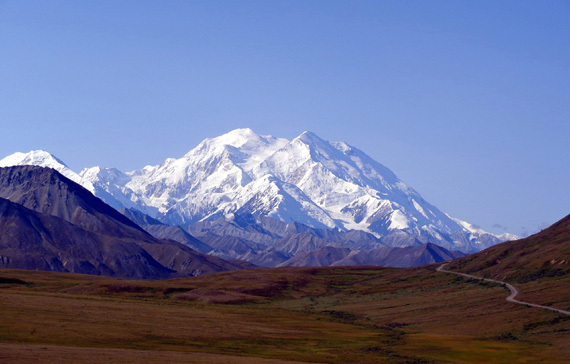 lifted the range, erosion [by massive glaciers] sculpted the landscape." 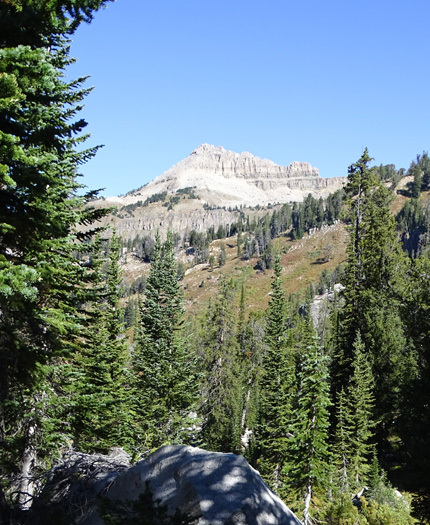 Although the brochure mostly describes the geology and ecology on the east side of the Teton Range within national park boundaries, most of the information also applies to the western side of the jagged mountain range in the Jedediah Smith Wilderness Area where I hiked today. 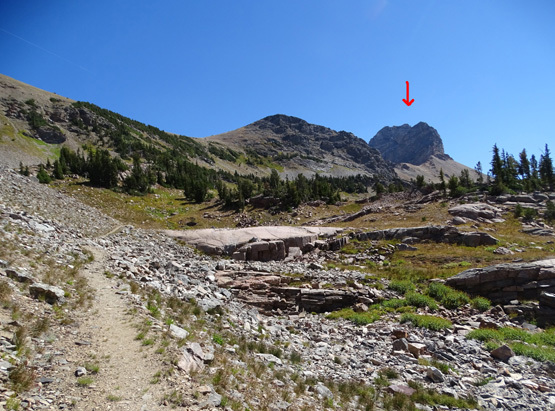 As you'll see from the photos in this entry, today was a great day for a very long hike (over 22 miles) on the western side of the Teton Range. 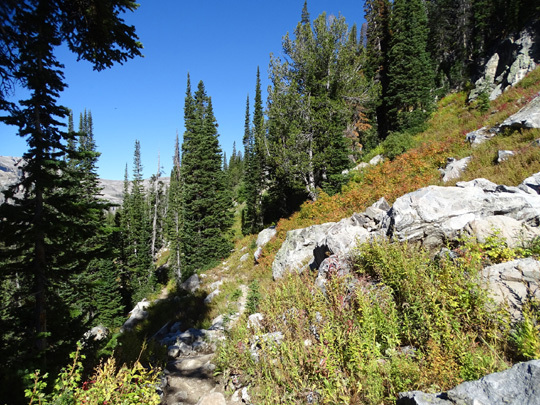 The weather was perfect again -- upper 70s F. in the valley, sunny, low humidity, some wind in Alaska Basin above 9,000 feet where the trees are lower and more sparse. 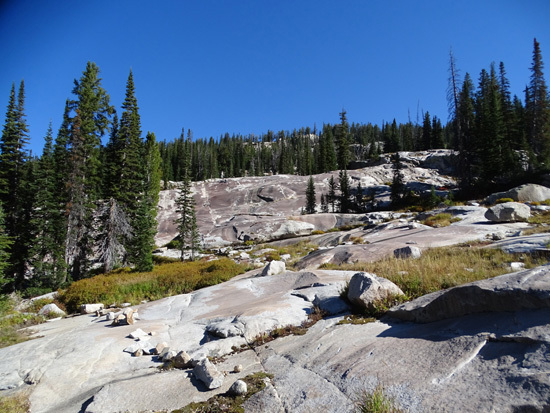 The sun was hot even up there, though, and I got dehydrated while hiking for twelve hours. 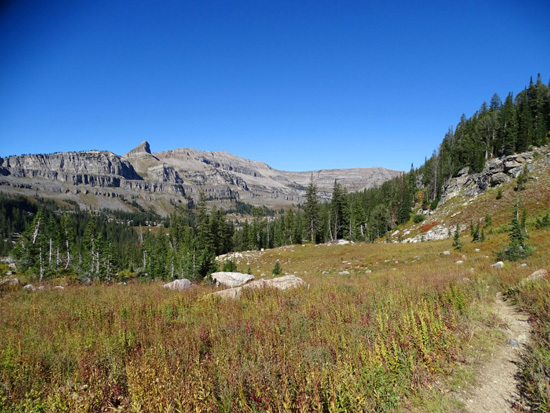 I wanted to do three long hikes in the four days we planned to be on the west side of the Tetons but that didn't happen. For one thing, we were here only three full days and parts of two others. And it's just not practical now for me to do three long hikes in a row. So I figured out a way to combine two of those hikes today into one more epic trek. Table Mountain, the other option, got "tabled," so to speak. My legs were too sore after today's lengthy hike to do Table Mountain on Friday or Saturday. That's OK; I've been up there several times before. Maybe I can do it the next time we're here. 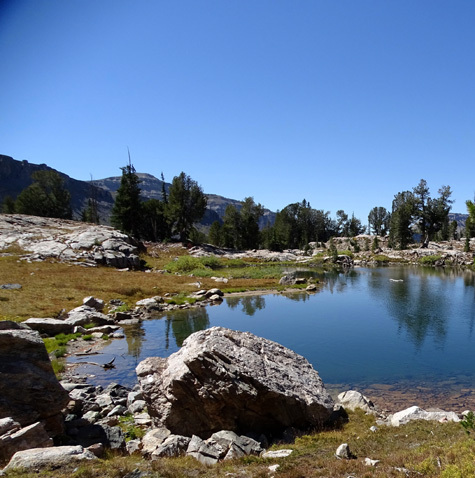 It has fantastic, close-up views of the major Teton peaks. 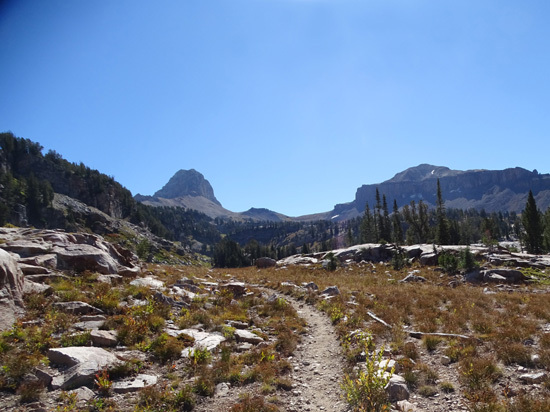 In the five previous times we've camped on this side of the Tetons I've hiked all of the trails I did today several times in one direction or the other and in various combinations. I think this was the first time I've done this many miles . . . on this many trails . . . in this exact configuration, though. 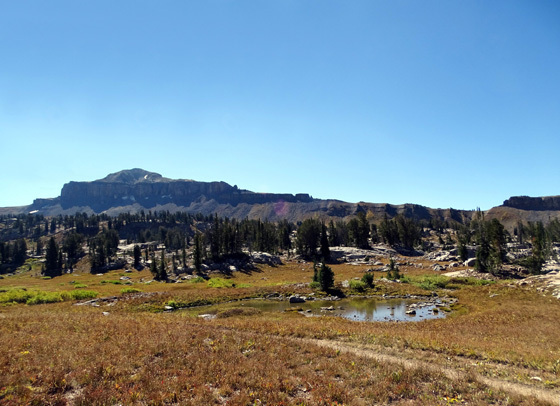 All of the route is in the Jedediah Smith Wilderness Area. On the east side of the loop near Buck Mountain the trails come very close to Grand Teton National Park, which is green on the GPS track. 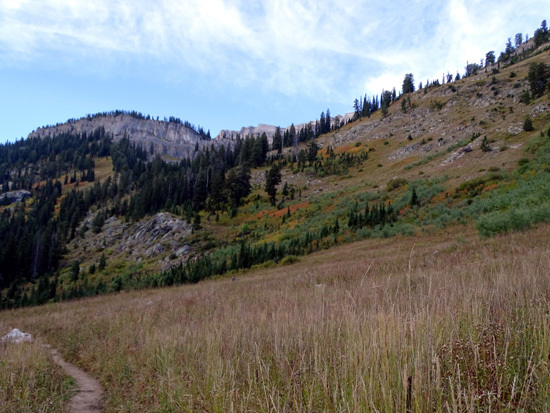 In 2013 I went from one side of the Teton Range to the other on part of these trails but today I was just in the wilderness area on the west side of the mountains. 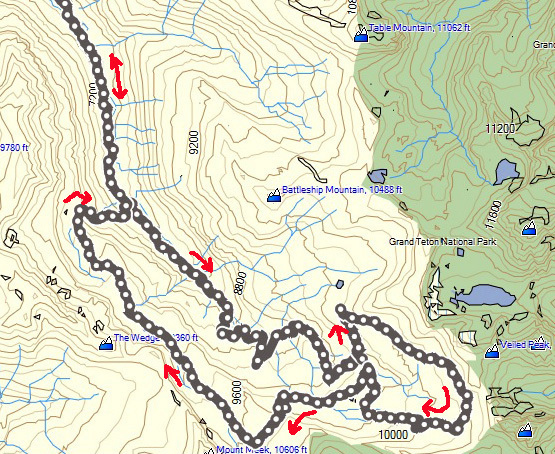 Our campground, Reunion Flat, is about two miles west of the Teton Canyon Campground shown at the top left of the map near the trailhead. 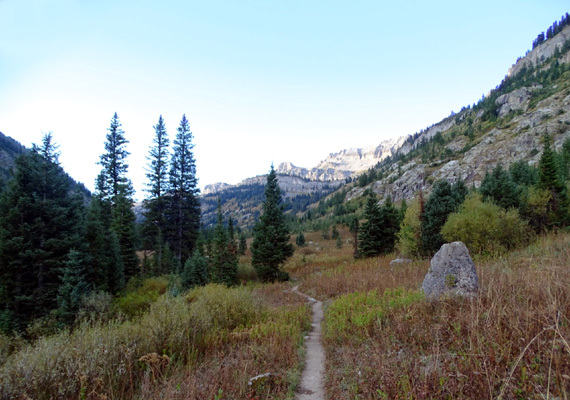 I had a total of 22.4 miles with an elevation gain/loss of over 8,200 feet ranging from just over 7,000 feet at the S. Teton Canyon trailhead to 10,419 feet in the upper part of Alaska Basin on the northwest shoulder of Buck Mountain. I figured I could hike that far today but what I forgot is that I haven't been anywhere near these altitudes all summer! 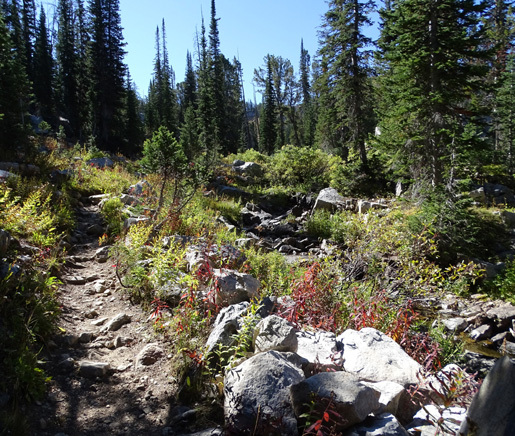 Even though I was in the tundra a lot in Alaska, most of my hiking there was at only 3,000-4,000 feet elevation. The high altitude contributed to my dehydration, as well as very low humidity and crystal clear skies most of the day. I started hiking at 7AM and finished about 7PM. None of my photos through the canyon the first and last 2.7 miles came out very well because the sun was so low that early in the morning and evening. 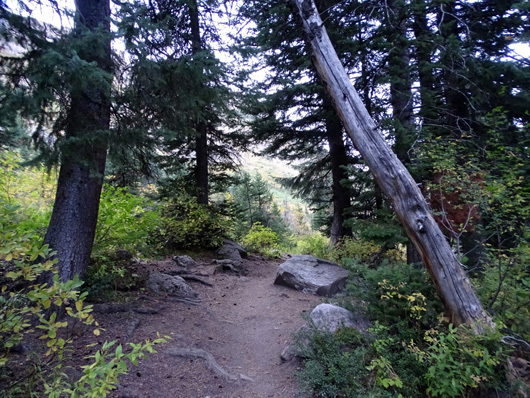 I've hiked this nice trail out and back numerous times. 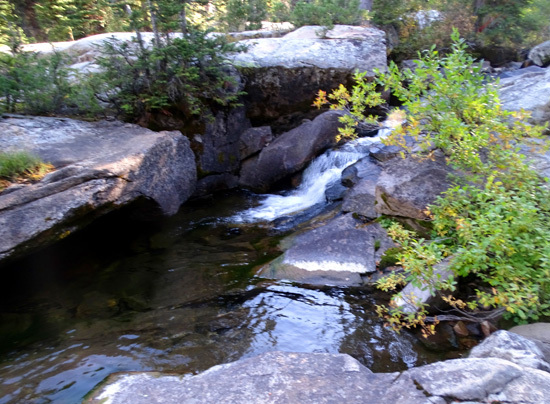 It's fairly smooth as it undulates through meadows and forests near South Teton Creek. 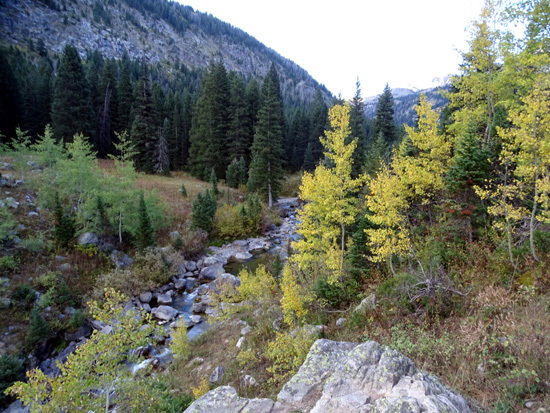 The elevation gain is only about 425 feet over 2.7 miles. There is a pretty large parking area at the South Teton trailhead. When I've hiked a couple weeks earlier in the season and/or in wetter years there have been many more flowers in bloom than this time. Now everything is mostly brown. His antlers looked mostly white so he didn't have much more velvet to lose. 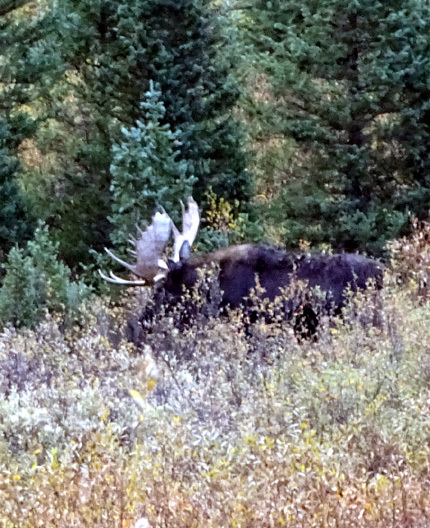 I've often seen moose along this trail so I look closely for them. 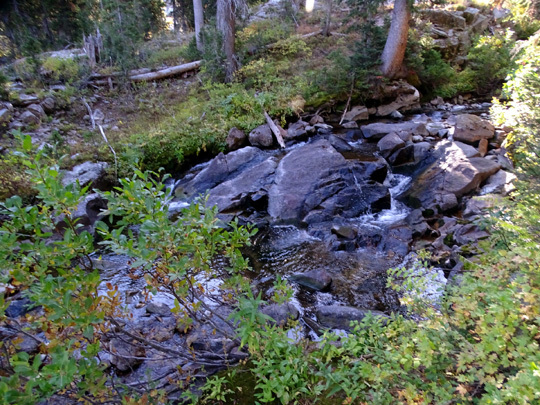 Bears also frequent the creek but they are more elusive and harder to spot. I didn't see one in the canyon today but I did up in Alaska Basin, where I've never seen one before. At 2.7 miles the trail comes to a "T" intersection. 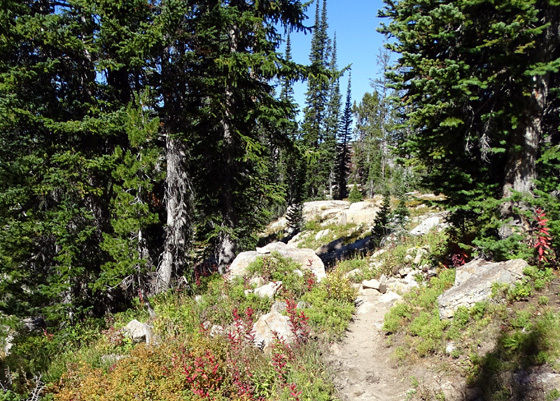 The trail to the right goes west and south up the Devil's Staircase to the Teton Shelf. 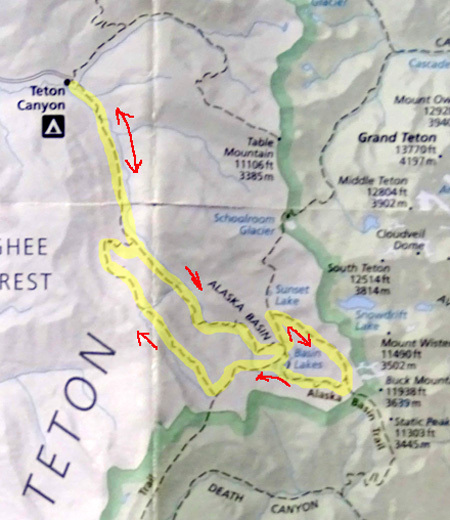 If you look at it on the maps above you can see that the shelf trail sort of parallels the trail up to Alaska Basin. 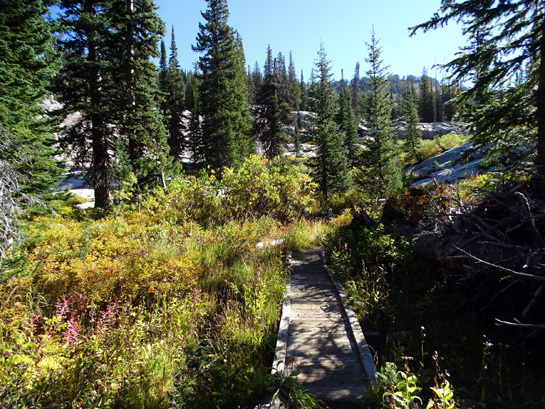 Instead of going up the Devil's Staircase and Shelf trails like I've done several times previously I went left for 5.1 miles on the main trail up to the edge of the Alaska Basin (a total of 7.8 miles from the trailhead). I've gone up and/or down this trail about ten times and I really like it. landmark to the southwest from much of Alaska Basin, too. 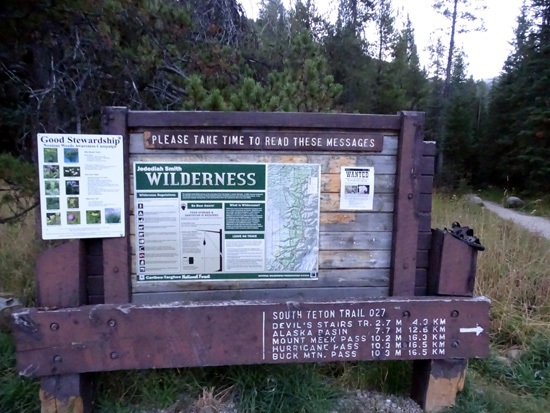 landmark along the Teton Crest Trail. Buck Mountain to left, Mount Meek to right. This section gains more elevation than the section through the canyon. 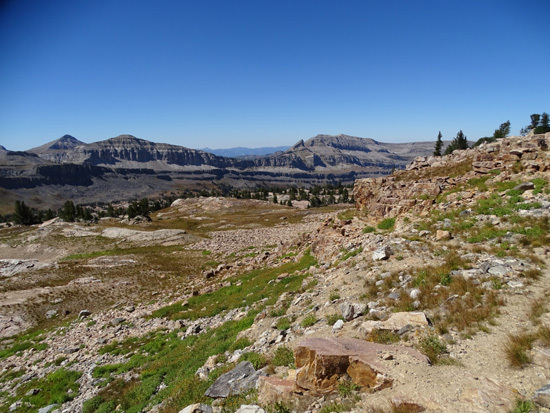 In just over five miles the trail gains 1,841 feet to the edge of the large alpine "bowl" called Alaska Basin. That's also a good place for a dog to swim and get a drink of water. numerous flowers along the banks. They're all gone now. 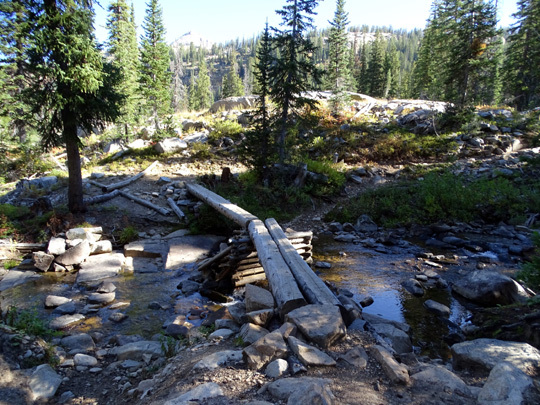 At sub-alpine and alpine levels you can just step across most of the streams.